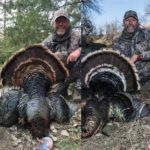 I’ve been hunting turkeys my whole life, and this hunt in Nebraska and Kansas with Red Dog Outfitters was one of the most fun I’ve been a part of. I completed my Grand Slam while we were there, and we filmed more turkeys than I’ve ever seen in one place before! I will definitely be recommending this hunt, and other hunts with Tim, because of the quality and professionalism. And you can guarantee that we will continue hunting with Red Dog Outfitters in the future.